Me and My Pink Mixer: Martha Stewart Cakes and Cupcakes Giveaway! 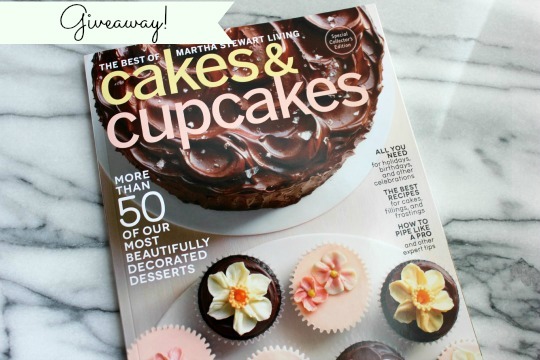 Martha Stewart Cakes and Cupcakes Giveaway! Cakes & Cupcakes? Darn her and her fabulous ideas. Anyway....I love it so much I decided to get one for you too. Like Me and My Pink Mixer on Facebook and come back here and leave me a comment telling me you did. 1) Share the giveaway on your Facebook page and leave me a comment here that you did. 2) Follow me on Twitter and tweet about the giveaway. Leave a comment here that you did. 3) Follow me on Pinterest and pin this giveaway. Leave a comment here that you did. Entries accepted until Thursday, February 28th. I'll announce the winner on Friday, March 1st. Congrats to Paula from Sweet Pea! New Facebook fan Melissa/Truly Chic Inspirations. I've been eyeing this great magazine too! I already like you on FB! I saw that book at the grocery store the other day, ALMOST bought it! I follow you on twitter, and tweeted the giveaway. I follow your Pinterest board and pinned the giveaway! I followed your FB page. I have followed you on Pinterest for a good while. I follow you on Pinterest and pinned the giveaway. I have been a FB follower as well as Google Reader subscriber for a couple years. I love your blog and have enjoyed quite a few of your recipes. I also love everything 'Martha'/ thanks for the chance to win this pub.